Here you will find informational articles on topics related to the Excel spreadsheets for civil and mechanical engineering calculations available from the DOWNLOADS page. This includes articles in the clickable categories below: pipe flow calculations, open channel flow, heat transfer/heat exchangers, storm water/hydrology, continuous beam analysis and design, open channel flow measurement, and pipe flow measurement topics. Scroll down on each category page to see all of the articles. Similar blog articles are available at our companion site, www.EngineeringExcelSpreadsheets.com. 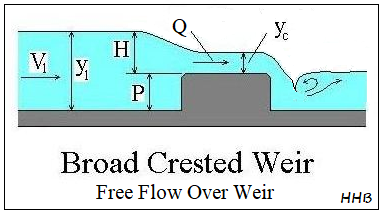 Figure 1, below shows a longitudinal section of a broad crested weir with free flow over the weir. A similar calculation can be made for submerged flow over the broad crested weir, in which the depth of flow immediately downstream of the weir is greater than the height of the weir. 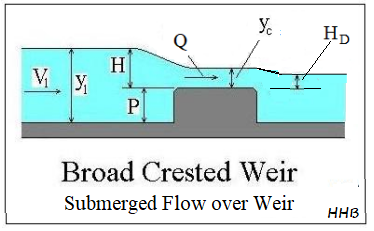 Submerged flow over a broad crested weir is shown in Figure 2 below. An example spreadsheet for broad crested weir calculations is partially shown in the image below. . This Excel spreadsheet can be used to calculate the flow rate over the weir or to calculate the required upstream head over the weir for a given flow rate. These calculations can be made for free flow over the weir or for submerged flow over the broad crested weir. This Excel spreadsheet, as well as others for open channel flow measurement calculations, is available in either U.S. or S.I. units for a very reasonable price in our spreadsheet store. easonable price in our spreadsheet store. 2. 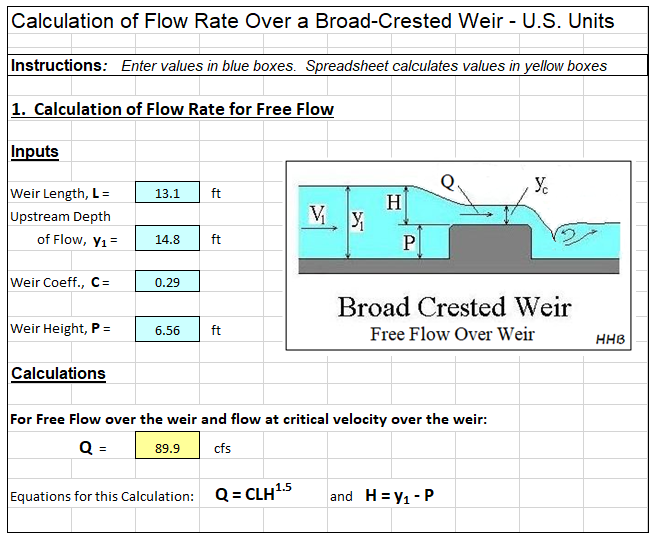 Bengtson, Harlan H., " Broad Crested Weir Calculations Spreadsheet," an online blog article. To obtain anSequencing Batch Reactor Denitrification Calculations Spreadsheet, click here to visit our spreadsheet store. This Excel spreadsheet is intended for making design calculations for either pre-anoxic or post-anoxic denitrification in a sequencing batch reactor. You can buy a convenient SBR denitrification calculations spreadsheet for a very reasonable price. It is available in either U.S. units or S.I. units. Read on for background information about sequencing batch reactor denitrification process design calculations. The sequencing batch reactor is a batch type, fill and draw alternative to the continuous flow activated sludge process for biological wastewater treatment, including BOD removal, nitrification and denitrification. The typical components of a sequencing batch reactor operating cycle for BOD removal and nitrification are shown in the diagram below. At least two tanks are typically used. In that case, the length of the fill period would be equal to the sum of the times for the react, settle and decant periods. Thus one tank would be filling while the other tank was going through the react, settle and decant periods and then the roles would be reversed. In order to achieve denitrification, an anoxic period must be added. 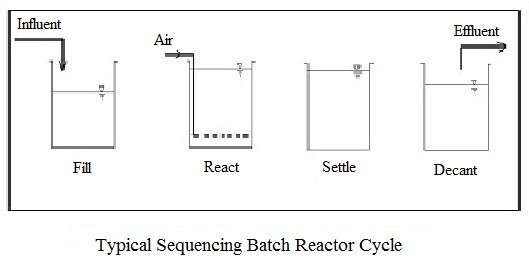 A typical sequencing batch reactor cycle for a post-anoxic denitrification process is shown in the figure below. A mixed anoxic react period is included after the aerobic react period. For a pre-anoxic denitrification SBR process, some or all of the fill period would be anoxic and there would be no anoxic react period after the aerobic react period. An example Sequencing Batch Reactor denitrification calculations spreadsheet is partially shown in the image below. This Excel spreadsheet can be used to set the times for the different parts of the SBR operating cycle, calculate the required tank size and check on the adequacy for nitrification and for denitrification. This Excel spreadsheet, as well as others for wastewater treatment process design calculations, is available in either U.S. or S.I. units for a very reasonable price in our spreadsheet store. 1. Metcalf & Eddy, Inc, (Revised by Tchobanoglous, G, Burton, F.L, Stensel, H.D. ), Wastewater Engineering, Treatment and Reuse, 4th Ed., New York, NY, 2003. 2. Metcalf & Eddy, Inc, (Revised by Tchobanoglous, G, Burton, F.L, Stensel, H.D. ), Wastewater Engineering, Treatment and Resource Recovery, 5th Ed., New York, NY, 2014. 3. Bengtson, Harlan H., "SBR Denitrification Calculations," an online blog article. To obtain a Fanno Compressible Flow Calculator Spreadsheet, click here to visit our spreadsheet store. 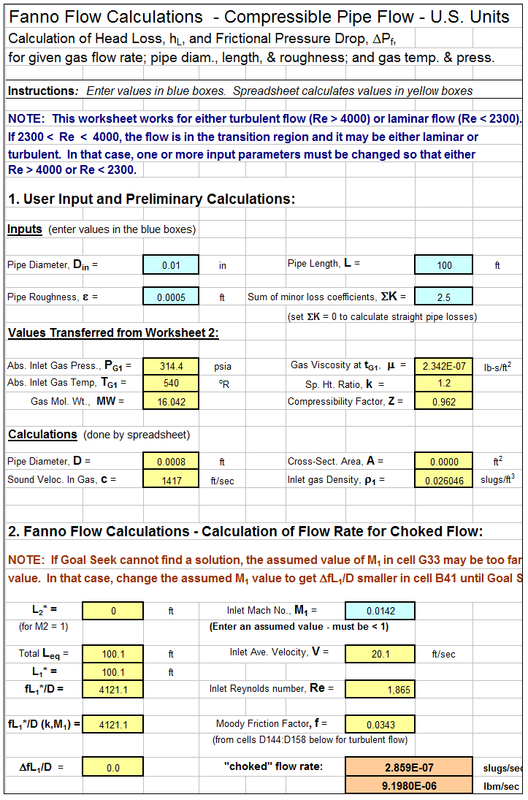 Look in the Pipe Flow Calculations category on the Download page. This Excel spreadsheet is intended to calculate the frictional pressure drop, gas flow rate, or minimum required diameter for adiabatic compressible pipe flow. You can buy a convenient fanno compressible flow calculator spreadsheet for a very reasonable price. Calculations may be made in either U.S. or S.I. units. Read on for information about using a fanno compressible flow calculator spreadsheet. Compressible pipe flow calculations are needed for gas flow if the density of the gas changes during the flow through the pipe. The fanno flow equations shown below can be used for calculations with a gas flow that has no heat transfer with surroundings. Frictional losses are taken into account. The fanno flow equations are shown below. An example fanno compressible flow calculator spreadsheet is partially shown in the image below. This Excel spreadsheet can be used to calculate the frictional pressure drop, or the gas flow rate, or the required minimum pipe diameter. This Excel spreadsheet, as well as others for pipe flow calculations, is available for both U.S. or S.I. units for a very reasonable price in our spreadsheet store. 3. Bengtson, Harlan H. Compressible Pipe Flow Calculatior Spreadsheet , An online blog article. 4. Bengtson, H.H., Pipe Flow/Friction Factor Calculations with Excel, an online continuing education course for Professional Engineers. To obtain a Dissolved Oxygen Solubility in Water Calculator Excel spreadsheet, click here to visit our spreadsheet store. Look in the Dissolved Oxygen category on the Download page. This Excel spreadsheet is intended to calculate the dissolved oxygen solubility at a specified water temperature and atmospheric pressure for water temperature of 35 to 80 degrees F and atmospheric pressure of 600 to 760 mm Hg. You can buy a convenient dissolved oxygen solubility in water calculator Excel spreadsheet for a very reasonable price. This spreadsheet calculates dissolved oxygen saturation concentration based on user specified water temperature and atmospheric pressure. Calculations may be made in either U.S. or S.I. units. Read on for information about using a dissolved oxygen solubility in water calculator spreadsheet. 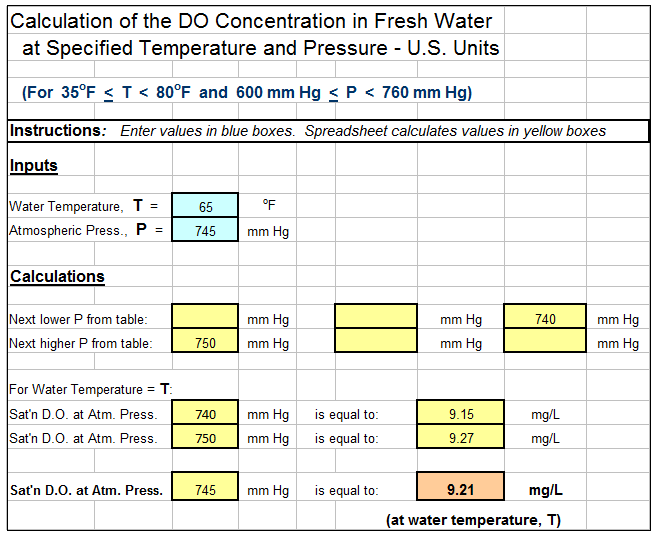 An example dissolved oxygen saturation in water calculator Excel spreadsheet is partially shown in the image below. This Excel spreadsheet can be used to calculate the dissolved oxygen solubility in water at a specified water temperature and atmospheric pressure. This Excel spreadsheet, as well as others for wastewater treatment calculations, is available for both U.S. or S.I. units for a very reasonable price in our spreadsheet store. United States Geological Survey, DOTABLES (Dissolved oxygen solubility tables), www.water.usgs.gov/software/DOTABLES/. Bengtson, Harlan, Dissolved Oxygen Saturation in Water Calculator, an informational blog article. To obtain a trilateration surveying data processing program click here to visit our download store. Look for "WinTri - A Computer Program for Trilateration" in the "Surveying" category to find it. This standalone program can be used for data reduction in connection with trilateration surveys. You can buy this convenient data reduction program for trilateration surveys for a very reasonable price (only $79.95). WinTri is a standalone computer program (not a spreadsheet) for trilateration surveying data processing. It can be used for reduction of data from trilateration surveys; in particular WinTri calculates the coordinates of stations. The program is general in that it will handle any surveying control figure that a user might specify. Data validation is a key feature of the program. Input data from surveys are extensively checked for errors, and warning messages are displayed on the screen when an error is encountered. In calculating results, WinTri employs least-squares adjustment. Win-Tri Help screens provide complete, annotated examples of all required input files. Sufficient explanation is given so that someone who has never used the program before can prepare all input data solely by studying the Help screens. This trilateration surveying data processing program is simple to use. Aside from Help screens, the program displays only three screens. The first screen is the title screen, and the second is a screen with a single message directing the first-time user to the appropriate help screen designed for beginners. The third screen displays seven command buttons: (1) Read master file, (2) Enter elevations, (3) Save elevations, (4) Read raw data, (5) Calculate coordinates (of stations), (6) Save results, and (7) Re-start. The buttons are enabled and disabled automatically as the program user proceeds through the various steps of the analysis. The "Save elevations" button allows the user to interrupt hand entry of elevation data, stop the program and subsequently start the program at a later time without having to re-enter those elevations that had already been entered. Besides the command buttons, the third screen contains a textbox labeled "Program Log." If a step in the operation of the program is successfully completed, the program log displays a message to that effect. If an error occurs, then the log displays a message describing the error. 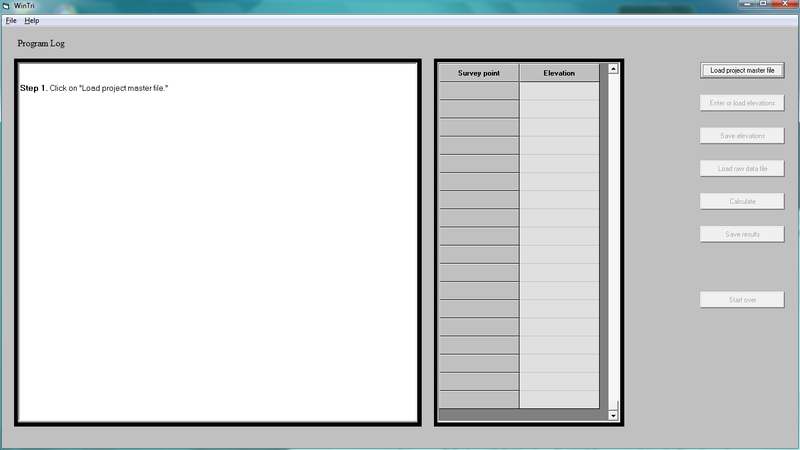 The image below shows a screenshot of the introductory screen of WinTri a trilateration surveying data processing program. In addition to an executable module that can be installed and run, the source code, consisting of about 5000 Visual Basic 6.0 statements is provided in case the user wants to revise the program to meet specialized needs. The program is thoroughly documented with commen" are used throughout so that much of the code reads like ordinary English. Anyone involved in trilateration surveys should find the program helpful. It is easy to learn, it can be used for any control network that the user specifies, and - most important of all - it greatly lessens the tedious and time-consuming task of locating and identifying errors in the survey data. Rossow, Mark, Trilateration Surveying Data Processing, An informational blog article. To obtain a tutorial program on shear and bending moment diagrams, click here to visit our download store. Look for "Understanding V and M Diagrams" in the "Strength of Materials" category to find it. This standalone program provides practice for learning the principles underlying shear diagrams and bending moment diagrams. You can buy this convenient tutorial beam diagrams program on how to draw V and M diagrams for a very reasonable price (only $4.95). This standalone program contains over 50 exercises, which have been chosen to represent all common boundary conditions and load cases for structural beams. The difficulty of the exercises ranges from easy to challenging. 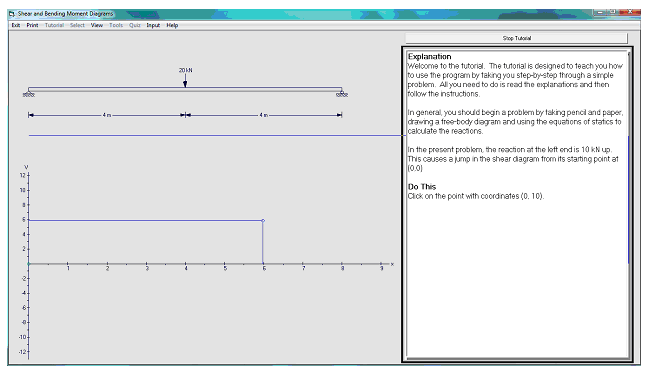 The program is highly interactive: starting with a point at the origin of the shear diagram, the user calculates the coordinates of the next point where the diagram changes slope or direction. Then the user employs the mouse cursor to plot this point on the screen. After plotting the point, the user specifies the type of curve (for example, straight line or curved line concave up), connecting the two points. The user proceeds in a similar manner to plot the next point on the diagram and connect it to the most recently plotted point. Continuing in this fashion, the user completes the shear diagram and then goes on to the bending moment diagram. A step-by-step tutorial on how to operate the program is provided which guides the user through a simple example on how to draw shear and bending moment diagrams. Diagrams defining sign conventions for V (shear) and M (bending moment) are given. Techniques for calculating V and M are described in terms of specific numerical calculations. The answer for the current step in the diagram construction is given—the value of V or M or type of curve connecting two points on the diagram. How the answer is calculated is explained in detail. A complete numerical example showing both shear and bending moment diagrams with key values labeled on the diagrams is provided. When the user positions the mouse cursor over any part of the diagram, a pop-up window opens containing an explanation of how that particular part of the diagram was constructed. 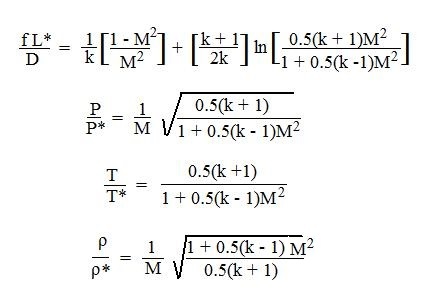 For example, positioning the cursor over the point of maximum moment on the beam (which is loaded with a distributed load) brings up the comment that the maximum moment occurs where the shear is zero. Positioning the cursor over a jump in the shear diagram brings up the comment that the jump is caused by the support reaction acting on the beam. A quiz facility is also provided for use of the program in a classroom setting. The beginning of the tutorial on Shear and Bending Moment Diagrams is shown in the image below. This program can be used to help understand V and M diagrams and how to construct them.